This beautiful animal, with neatly defined brown, black, and yellow patterns on the back, occupies a wide range in the African savanna and forest country. It attains a length of 16-18 feet and has been reported to feed on anything from lizards to birds and even small antelopes, although most wild specimens subsist on small rodents. 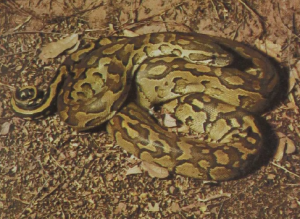 Like most other boid snakes, the rock python has a series of heat- sensitive pits on the sides of the face that are able to sense passing warm-blooded prey. The pits of both sides are used to triangulate and aim a strike accurately, even in complete darkness. 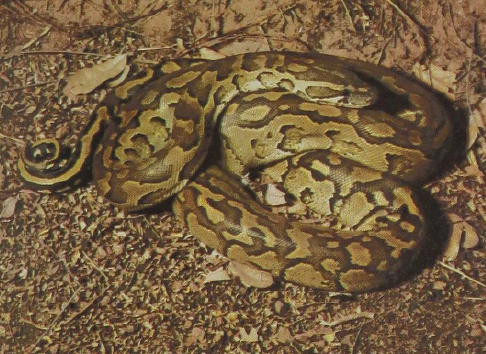 The Indian and African pythons have been observed to brood their eggs, coiling around them and by continuous twitching of their muscles raising their temperature by a few degrees, thus incubating them until they hatch.